When it comes to Sangria, I am a traditionalist. It is red wine with citrus fruits added. 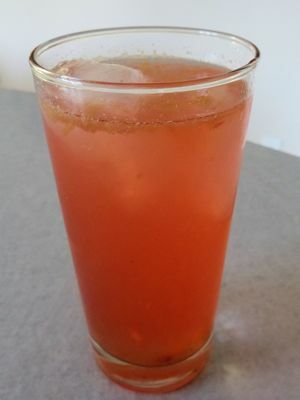 However, when I posted my Classic Sangria Recipe several people referred me to white wine sangria recipes and She Who Must Be Obeyed “suggested” it would be nice to have some white wine Sangria. Who was I to argue? I started by pitting the cherries. Then I gave them a squeeze and dropped them in a pitcher. I peeled a peach by putting it in boiling water for 1 minute and slipping the skin off. Then I coarsely cut the fruit off the pit and put it in the pitcher. I coarsely cut the nectarine off the pit and put it in the pitcher. I cut the 1/2 lemon, 1/2 lime and 1/2 orange into quarters. I squeezed each quarter over the pitcher and dropped it in. I added the wine and sugar to the pitcher and let it sit overnight. Pour a glass 1/2 full and add 2 ice cubes. Top up with club soda and serve. This may change me to a white wine sangria drinker. It is fresh and tasty with a nice fruit flavour against the tart of the citrus and wine. I will be making it again. Squeeze each cherry over a pitcher and drop them in. Peel the peach by plunging it in boiling water for a minute and then peel the skin off. Slice the fruit off the pit and put it in the pitcher. Slice the fruit of the pit of the nectarine and drop it into the pitcher. 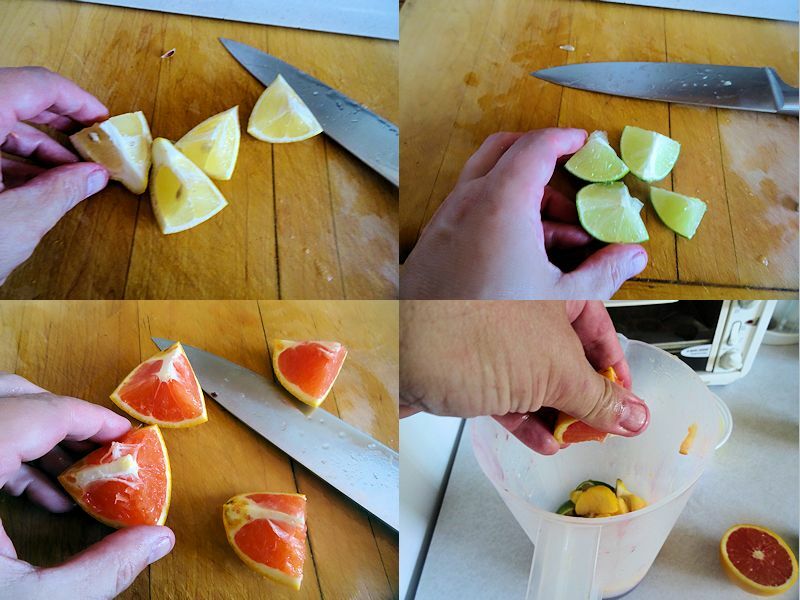 Cut the 1/2 lemon, 1/2 lime and 1/2 orange into quarters. 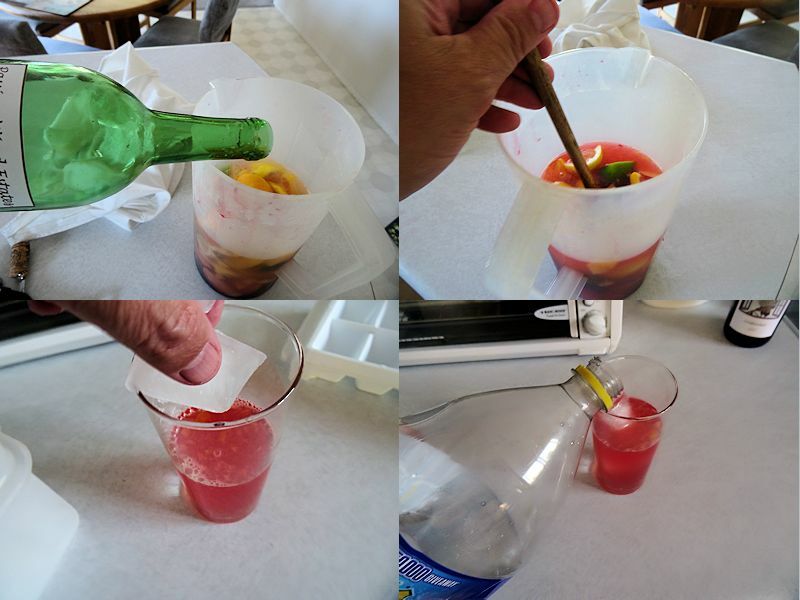 Squeeze each quarter over the pitcher and drop it into the pitcher. Add the sugar to the pitcher. Put the wine in the pitcher and stir to dissolve the sugar. Put the pitcher in the fridge for a minimum of four hours to overnight. Pour a glass 1/2 full of the wine mixture. Add 2 ice cubes and top the glass off with club soda. Looks delicious Disco, SHMBO’d was right as usual. If you ever get to Tampa Florida, their is a famous resturant there called “Old Columbia” You gotta try their sangria. I am not normally a large wine drinker of the grape but these guys make the most unbelievable brew. Oh, did I mention they made it at the table for you, and desert was coffee with a liqueur and a hand roller cigar! It was great. Har! Apparently, she is always right (even when she isn’t). Your story reminds me of a trip we did to Cancun. My buddy used to smoke and like a good cigar but had quit for a while. While we were there, he bought a top of the line Havana. He lit it up and took a pull. It is the only time in my life I saw human skin turn green.